Our world is changing. Climate changing. Each of us will play a role to measure and manage our carbon footprints for a better tomorrow. This change also presents opportunity for impact through our work. 195 countries have committed to bold goals in the historic Paris Agreement, including Canada. How will we meet our greenhouse gas (GHG) targets? Join us and begin to envision these opportunities together. The Ontario Government published its Climate Action Plan supported by a budget that includes $7 billion in spending on this issue. Toronto City Council earlier committed to reducing the footprint of the city by a remarkable 80% by 2050 — one fifth of 1990 levels! How this reduction will be achieved is not yet known. It will involve each of us as well as the ingenuity of tomorrow’s businesses. This change has already begun. Entrepreneurial and employment opportunities in the new ‘Carbon Economy’ are already growing at a rate 4 times the rest of Canada’s economy. Just as the Internet has touched and in many cases transformed most every industry and our lives, so too will the Carbon Economy touch every arena — sooner or later. How will this intertwine with your future? 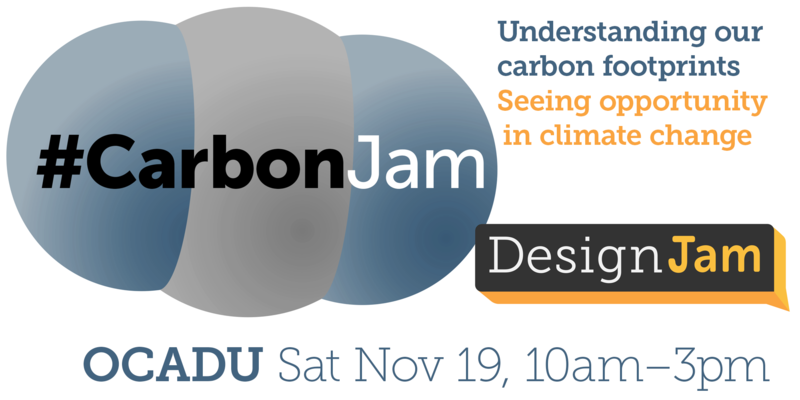 In this first in a series of events, DesignJam will look at the Carbon Economy at the micro level — the personal. Later events will focus on the meso level — our city — then the macro, provincial level. Come co-create with us using foresight and data visualization tools, first by looking at our own carbon footprint. Do you already know your carbon footprint? We ask all participants to be arrive at the event knowing their own personal carbon footprint. DesignJam encourages use of the footprint calculator created by a local social enterprise Project Neutral. Project Neutral is a CSI and sponsored by the Toronto Atmospheric Fund. Project Neutral helps you to benchmark, compare, set reduction goals, and take ownership of your carbon footprint. Michael Sacco, ChocoSol, champion of socially just, equitable, ecological food. With a vision statement of fighting climate change and creating a just food system through chocolate, coffee, maize, and conviviality, you may know ChocoSol for amazingly delicious and nutritious chocolate and coffee. The recipe for these and other great products is a case study in social entrepreneurship. Chocosol is a learning community that focuses on making the ‘food of the gods’ – cacao – into stone-ground, artisanal, dark chocolate. Chocosol's social enterprise model engages in the passionate work of re-making a more ecological, just, and meaningful civil society. It's about combining learning and earning through disciplined research and creativity. Additional speakers, tentatively from Zero Lab (OCAD U), & Urban Water Institute (Ryerson U), will be announced shortly. This event is part of a series led by OCAD University and Ryerson University, bringing together in depth knowledge of entrepreneurship, social innovation and design thinking processes. Funded by the Government of Ontario through the Ontario Network of Entrepreneurs (ONE), Ontario's innovation system. The ONE is made up of regional and sector focused orgarizations designed to help Ontario-based entrepreneurs rapidly grow their companies, and create jobs. For more information visit oneinnovation.ca."